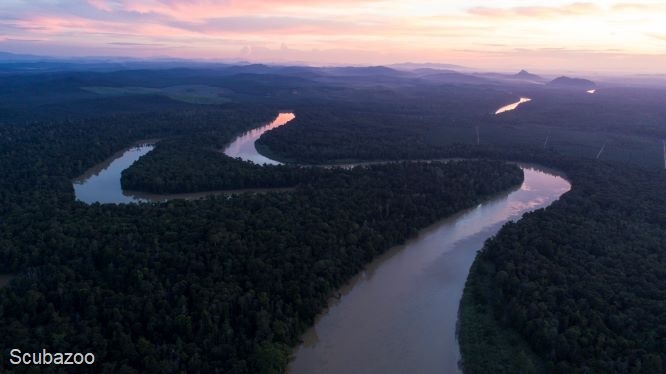 In line with the State government’s initiative to create a better network of roads in the rural area and improve connectivity and transportation for local rural produce, a proposal of constructing a new bridge over the Kinabatangan river was disclosed to the public at the end of 2015. The aim was to upgrade and construct a new paved dual carriageway branching from an existing gravel road of Jalan Sukau to Jalan Moresem via a new bridge over the area of Sukau village. The satellite data accumulated between 2008 and 2015 from 14 elephants showed the importance of Sukau village for their movement. DGFC disclosed the scientific evidence to the public (press releases), the government and the private sector (ad hoc meetings), highlighting the possible human-elephant conflicts to arise if the construction of a road and bridge bisecting the wildlife sanctuary went ahead. The floodplain was at risk of losing its integrity as a safe haven for communities and wildlife. floodplain. The vision document was submitted to the Sabah Chief Minister on 7 April 2017. Later in the same month the Chief Minister of Sabah officially announced the abandonment of the project. Save Kinabatangan continues working towards the sustainable governance and preservation of the Kinabatangan floodplain.